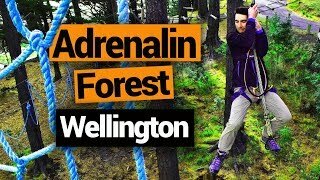 New Zealand’s best flying fox locations! Who doesn’t like a good zipline? Speedy flying fun above lush New Zealand forest or over a terrifyingly deep canyon is just plain and simple fun that you can experience is multiple locations throughout the most adventurous country in the world. To zipline in New Zealand, or “flying fox” as they say here, is more than just your playground apparatus. It’s taken to a whole new level with ziplining courses hundreds of metres above trees, over river gorges or even in underground glowworm caves! So when you’re looking to make like a native New Zealand bird and soar over New Zealand’s forests, look no further than this list of awesome places to zipline in New Zealand! Explore New Zealand native forest from a whole new perspective while zipping down 650m worth of ziplines. The tour includes six ziplines, with the longest one being 220m, and a couple of treetop swingbridges added in the mix too. Rotorua Canopy Tour-goers often encounter native birds while learning a great deal about the fascinating New Zealand wildlife. Education has never been so epic! While you’re in Rotorua, don’t miss these 10 Rotorua Must-Dos! Location: 13km from Rotorua. 147 Fairy Springs Road, Fairy Springs, Rotorua. How you go down the zipline is up to you on these 4 to 6 line tours through the pine forests of Queenstown. These incredible flexible harnesses at Ziptrek Eco Tours allows you to go down by bomb, starfish, upside down or whatever the hell your body lets you! Ziplines vary in length and speed with the longest zipline being 300m. You’ll get some stunning views over Queenstown along the way while learning a thing or two about conservation of the New Zealand forests. 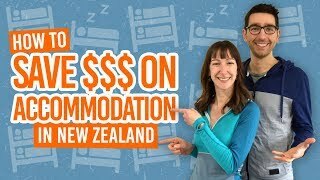 That’s just another thing to add to your Queenstown must-do list! Location: Queenstown. 45 Camp Street, Queenstown. (Up the Skyline Gondola). For just a pure insane adrenaline rush, get yourself to the Canyon Fox in Queenstown. Choose your speed as you run or ride a rail from one side of a canyon, experience a terrifying drop, then let the zipline take you the rest of the way. Just as you have got over the first zipline (which is 182m high by the way), do it all over again as you take the second zipline back to the other side of the canyon. Location: Queenstown. Pick-ups from Queenstown centre, 34 Shotover Street, Queenstown. Ziplining is best shared with friends, right? 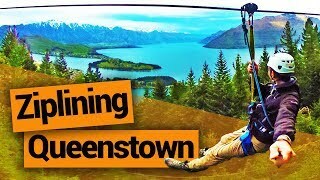 Get into this 4-seater ziplining vessel complete with racing car chairs (and without uncomfortable harnesses) and fly at 150m over beautiful New Zealand forest. What’s more, there’s 3 whole kilometres to experience both forward AND backwards. While you’re in the area, see more 15 Things to Do in Nelson City. Location: 16km from Nelson. 194 Cable Bay Road, Nelson. One of the many awesome things to do at the top of the Skyline Gondola in Rotorua is to come back down the fun way: ziplining 400m! There are two ziplines side-by-side so race your mates and let gravity do its thing! That’s another good reason to eat way too much Maori Hangi the night before! Location: Rotorua. 178 Fairy Springs Road, Fairy Springs, Rotorua. Waiheke Island is not just about the wine tasting and beaches. Fly above native forest and vineyards on three whopping 220m ziplines each getting faster and steeper in gradient. At the end of your flying fox thrills, enjoy a walk back to base through stunning forest while your guides explain about its intriguing ecosystem. Book your tour with Ecozip Adventures. Location: Waiheke Island, Auckland. 150 Trig Hill Road, Onetangi, Auckland. Let’s be honest, bungy jumping is not for everyone… But ziplining pretty much is! While your family or buddy are launching themselves off the famous Kawarau Bungy Bridge, have your own fun alone or tandem on the Kawarau Zipride. It’s one ride of 60km/h thrills of 130m! Location: 23km from Queenstown. State Highway 6, Gibbston Valley, Queenstown. Yes, that’s right, you can even zipline in caves in New Zealand. Soar under stalactites and glowworms in the Saint Benedict’s Cavern in Waitomo with Waitomo Adventures. Admittedly, ziplining is just a part of this tour filled with other adventurous ways to get through stunning limestone caves, including two 60m abseils. 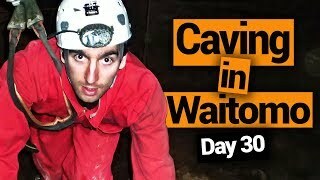 Pllus, it’s just one of many awesome ways to experience the Waitomo Caves. Location: Waitomo. 654 Waitomo Caves Road, Waitomo. Another Waitomo cave adventure to be had is with The Legendary Black Water Rafting Co. Explore limestone caves filled with glowworms on this climbing tour taking you over ladders, wire bridges and along cave walls via climbing, abseiling, and ziplining! Have you ever ziplined in the dark? Location: Waitomo. 585 Waitomo Caves Road, Waitomo. Unleash your inner monkey with these hire-wire courses found in Wellington, the Bay of Plenty, and Christchurch. This affordable activity will have you tackling treetop challenges and zipping down multiple ziplines as you go one your own self-guided adventure in the trees. Location: Wellington – Okowai Road, Aotea, Porirua. Bay of Plenty – Weld Road, Upper Pyes PA Road, Tect All Terrain Park, Tauranga. Christchurch – 105 Heyders Road, Brooklands, Christchurch.